I so wanted to call these breakfast sandwiches ‘Elvis’ McMuffins, but I think copyright might not have been on my side there. I am doing a couple of breakfast recipes this week. No idea why, but it does happen to be my favourite meal of the day. Whenever we go on holiday, we never take breakfast in our hotel. I love the adventure of going out to try new places for breaking fast. It can vary widely, depending on which country you are in. From a greasy fry-up – to waffles and maple syrup, I love how diverse the first meal of the day can be. Personally, and you will not be shocked at this, but I prefer a sweet breakfast. Give me a stack of pancakes over a plate of sausages and fried bread any day. 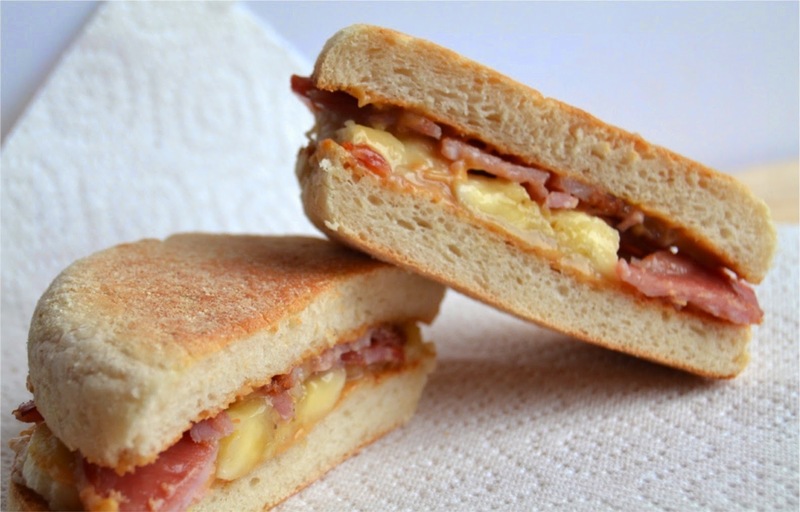 But I decided to try and combine the two, inspired in part by the fast food chain's McMuffins and the sweet/savoury combo which reportedly was a favourite of Elvis Presley – the Banana, Peanut Butter and Bacon sarnie! English Muffins are so overlooked when it comes to breakfast, unless of course you are buying food to go. Until I made this I can honestly say I have never bought them before. So I ventured into the supermarket and purchased some, plus all the fixings for these tremendous Elvis Breakfast Sandwiches (or Macky D Muffins)! I don’t fry my bacon, but cover it with brown sugar and pepper and pop it in the oven to crisp up. So easy and less mess when you cover the tray underneath with a spot of foil or greaseproof paper. Preheat the oven to 180C and line a grill pan. Place the bacon on the grill pan, sprinkle with the sugar and grind some black pepper over the top. Pop into the oven for 10 to 15 minutes. The edges will turn crispy and the sugar will have melted. Remove from the oven and allow to cool whilst you slice up the bananas and toast the split muffins. Spread each half of the muffins with peanut butter and place the bananas on one half of muffin. Tear up the bacon into pieces and place onto the other half of muffin. Bring both sides together and press the muffin down. That’s it! It really is quite easy and delicious for a breakfast treat. The sweet meatyness of the bacon goes well with the fruitiness of the banana and nuttiness of the PB! Enjoy. And thanks to Dundee's new Brewdog craft beer pub for giving me the red basket which the sandwiches are housed in! Probably best for a Sunday brunch Gary lol! Breakfast is my favorite meal of the day too! I will have to try making bacon like you in the future. I crisp them in the oven, but never thought to sprinkle with sugar/pepper/etc.! It is so good like that Stephanie, trust me! How delicious do these look? I need one right now Stuart - can you deliver please? Hmmm, not a banana fan... but if you lose that I am fully on board with bacon and PB! Maybe a drizzle of maple syrup... I do love an English muffin but as you say, we always seem to overlook them unless we are under the golden arches! Of course they would be just as good without the banana, perhaps apple or pear instead?! 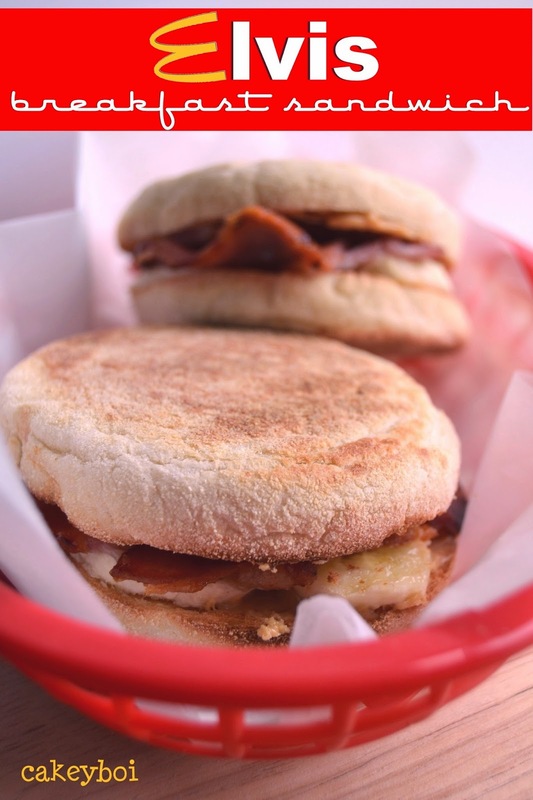 Love your Macky D Muffins aka Elvis Bkfast sandwiches! I am first going to try doing my bacon rashers like you do , I hate cleaning my oven so I love that tip of using the grease proof paper , I am so careful with my baking trays even ones from 3 years ago look good as new ! Now if only I had the same zeal to clean my oven !!! Oven Pride is the best stuff ever Manjiri!! Strips off the worst messes ever! I love breakfast when on holiday too. Never heard of that way of doing bacon. Give it a go Sally, you will never go back! Bananas and bacon? Sounds completely bonkers to me but I bet it is just one of those combinations that 'works', especially with the peanut butter. Yum! Oh yes, Elvis couldn't be wrong - could he?? You see, I am soo addicted to pancakes that I just wrap up bacon, sausages and banana in pancakes. Need to try this one though. Oh, I like the sound of your pancakes Bintu! Well, that's different. I'm a big fan of muffins and bananas and bacon. I'm just not certain about them all at once but I'm willing to be persuaded. I usually avoid the hotel breakfast and go and look for something different but I must admit that if I think of some of the best breakfasts that I've ever eaten, then several of them have been in hotels. Admittedly, they were all small independent hotels.Sometimes you get lucky. 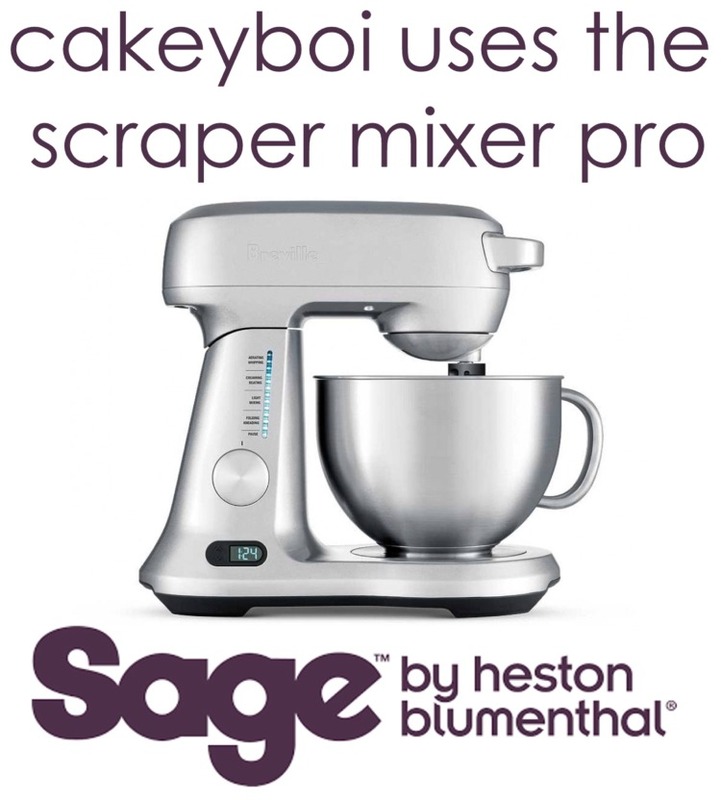 Give this a go Phil, honestly - you will be a total convert!